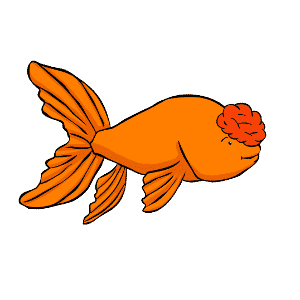 Most goldfish owners drop their goldfish’s food into the tank each day without giving it a great deal of thought. However, in the wild, the food that goldfish eat varies throughout the year, as the seasons change and the temperature rises and falls. Even when you keep your goldfish in the stable environment of a tank, your fish will go through distinct cycles throughout the year, with changes in their activity and feeding behaviors. 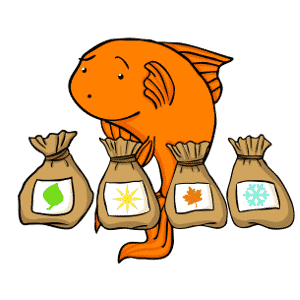 Read on to learn more about how to feed your goldfish for every season. As your fish begin to liven up and come out of their winter slowdown, their feeding requirements will increase. Goldfish will also be starting to get ready for the breeding season, which means they will need higher levels of protein to support the production of milt and eggs. 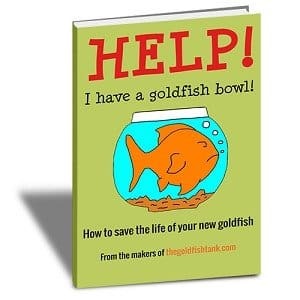 Increase your goldfish’s feeding routine slowly as they start to become more active, and if you wish to breed your goldfish, cut down their dry food in favor of more protein-rich offerings, such as live or frozen food. 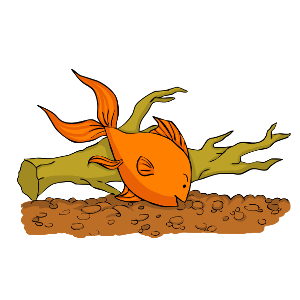 Goldfish will generally be at their most impressive in terms of their color, brightness and activity levels during the summer. Though high temperatures can make them rather lethargic sometimes too. Breeding season will have passed by the time the hottest weather arrives, so cut back on the live food in favor of feeding more dry food. As the days grow shorter and the temperatures start to drop, your fish will be getting ready for the cold winter period of reduced activity. This means that they need to build up their food reserves to tide them over the cold months, when they will naturally be eating very little. Feed a diet similar to what you offer in the springtime, with high levels of protein and nutrients, and less dry food. Live or frozen food once or twice a week is a good way to supplement your fish’s protein levels. Exactly how you should feed your fish in the winter depends on how low the temperatures drop and how your fish respond to this. If the tank environment is cold then your fish are likely to eat very little. If your fish are not eating then do not keep giving them food. You will only have to clean out waste food to avoid it throwing your water parameters off balance. If your fish are still moving around and actively looking for food then feed their regular dry flakes or pellets until the springtime comes again and your fish get more lively.